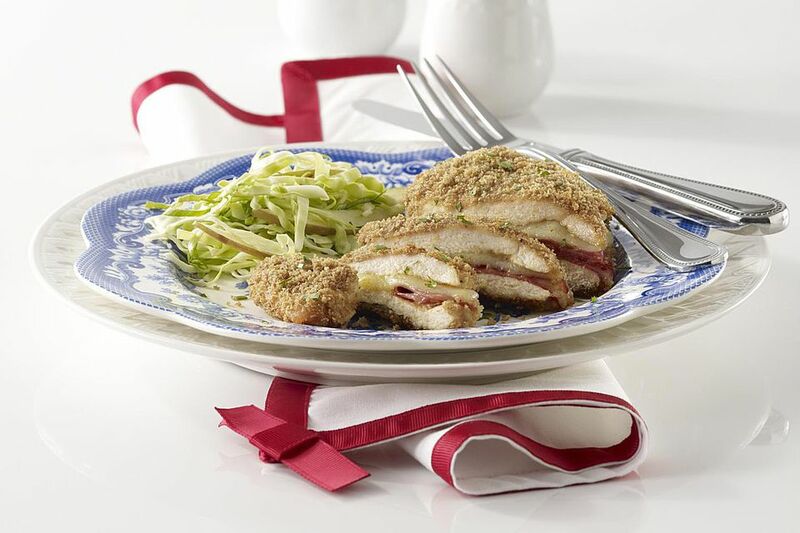 Real chicken cordon bleu is a complicated recipe. Chicken breasts are pounded flat, then filled with ham and cheese. The breasts are rolled up, fastened with a toothpick to hold the filling, then coated in egg and bread crumbs. Sometimes the dish is deep fried; other times it is sauteed and baked until the chicken is cooked and the cheese is melted. It's a wonderful recipe but fussy to make. Why go through all that work, when with just three ingredients and your crockpot, you'll get a dish that tastes just like it? For a full meal, consider adding baby carrots and onions to the crockpot under the chicken and ​serving with brown basmati rice. Put the chicken breasts on the work surface and cover with plastic wrap. Flatten each chicken breast with a wooden mallet or a rolling pin until each is about 1/3" thick. Be careful not to tear the chicken or make any holes or very thin spots. Remove the plastic wrap. Place a piece of cheese in the center of each chicken breast. Fold up the chicken and secure with toothpicks to enclose the cheese. Place the chicken bundles in the slow cooker. Combine the soup, water, and pepper in a small bowl and pour over the chicken bundles, making sure that all of the pieces are fully covered. Cover the crockpot. Cook on low for 6 to 7 hours, until chicken is thoroughly cooked to 165 F as tested with a meat thermometer.